The "pro-life" link-- amazing article (as well as this analysis). "What other rights beside privacy are "implied" by the Constitution, if any? 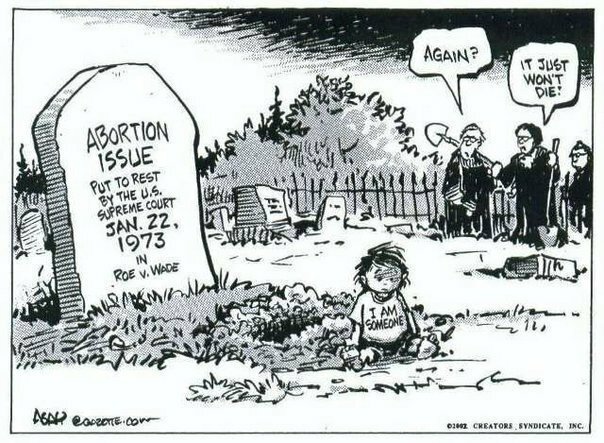 And what is "private" about an abortion--is it any more private than infanticide?" This goes along with your analogy to murder within your own home. I was wondering that myself. "...the idea that the Court decides how to interpret the Constitution on what they deem to be "popular opinion" contradicts the original purpose of the Bill of Rights....The Supreme Court is actually supposed to protect people FROM majority opinion; for example, it will uphold unpopular demonstrations as protected free speech, or protect suspected criminals from a biased trial." Yes, exactly. As in they should be protecting the unborn from slaughter, as unheard minorities, rather than women from psychological burden. "First, it would seem apparent that the unborn was not specifically mentioned at the time because the framers of the Constitution did not have adequate medical knowledge to know what we do now about the biology of the unborn; or, they assumed that it would be clear that the unborn was covered, since they didn't deem it necessary to specify that each stage of a person's development was constitutionally protected. The Court seemed perfectly content to ignore these very real possibilities, and placed the liberty of the woman above the unborn's right to live." Yes, the interpretation is very broad *and* contradictory. "So how can we say that we have a constitutional right to privacy that extends to abortion even though it is not mentioned in the Constitution, and then turn around and deny rights to another human because the unborn wasn't specifically mentioned!?" A-MEN. Literally pulling out words that were not there, then saying we can't do that. I was thinking about this a lot and was so glad she mentioned it. I just finished my history class-- actually I just took my history final today and had to write an essay on the 1857 Dred Scott decision, which was clearly an unconstitutional Court decision. The courts and the laws have not always been known for their fairness and accuracy in understanding the Constitution. There is a history of nitpicking who is a "real person" and unfortunately we are not past that stage. "Recall the 1857 Dred Scott v. Sanford decision, which declared that slavery could not be prohibited by Congress in any territory of the U.S. and that African Americans were not full persons and not afforded the same rights as "full persons." Sound familiar? President Lincoln argued that the slaves were persons, not possessions, and that their unalienable right to liberty was protected by the Declaration of Independence unborn. To add to the irony, after the Emancipation Proclamation in 1863, came the Thirteenth (1865) and Fourteenth (1868) Amendments, all which overthrew slavery and the erroneous Dred Scott Supreme Court decision. The Fourteenth Amendment...how ironic. One of the Amendments which helped overturn Dred Scott is now used to further the "non-person" argument -the same argument the Amendment was created to prevent!" "So, Blackmun states that the judiciary should not speculate as to when life begins, and then precedes to do just that as he defines levels of fetal protection based on trimesters." "Ridden with contradictions and highly debatable constitutional decisions, I hope that one day Roe v Wade is chalked up, just like Dred Scott v Sanford, as one of the grievous errors of the Supreme Court, and overturned. Until then, it seems as if the discrimination will continue against those who are unable speak for themselves - the type of discrimination the Constitution should fight against, not justify." Two things to note about the Roe and Doe cases: 1) the ladies Roe (McCorvey) and Doe (Cano) since then are pro-lifers and 2) those cases were brought on especially the Doe case by fraudulent claims by their pro-abort lawyers with agendas of their own beyond their clients. There are at least some Liberal philosphers -Peter Singer among them- the think RvW was a bad decision, but as long as it supports your sides view of things what the hey. BTW I'd love to get the opinions of the current Supreme Court on these issues and their general understanding of the underlying philosophy. But I suppose there would be a legal reason why one couldn't interview them on it.